I'm back in Texas, you guys. Precocious Daughter and I flew into D/FW on Wednesday night. Because it was Turkey Day Eve, I was deathly afraid we were going to encounter traffic, long lines, security nightmares, flight delays...Nope. The trip went about as smoothly and as easily as you could wish. Kind of like the entire vacation. I had the best time in Milwaukee. I needed this trip. It's not just that I needed a vacation (which I really, really did), but I needed specifically this vacation. I needed time with PDaughter, time with my family, time in my hometown. Because I'm not the same person I was the last time I lived there, and I felt I had to find out just who I had become since then. I'm pleased and relieved to report that I did, and I'm happy with that person. First things first: Yes, I got my picture with the Bronze Fonz. but it was still coolamundo. 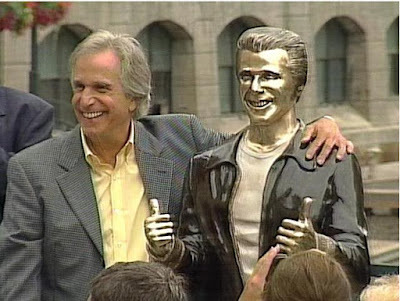 Shout-out to the parking lot attendant with the beautiful Irish brogue who collected our $2.00 so we could roam the Milwaukee Riverwalk and pose with the statue. Also, I'd like to take this opportunity to state that every single person we encountered on our trip was friendly and nice. Well, except for maybe the hostess at Tenuta's Italian restaurant on Clement Ave., who is probably the only person on Earth to return PDaughter's big, bright smile with a sneer. Maybe she was on the rag, I don't know. Anyway, I was able to show my girl a lot of my city. I'm proud to say I still mostly knew my way around after all these years, and when I needed help, PDaughter was right there to help me navigate via cell phone. We make a good team. We went to the Mitchell Park Domes, you guys. Again, bucket list. You won't regret it. 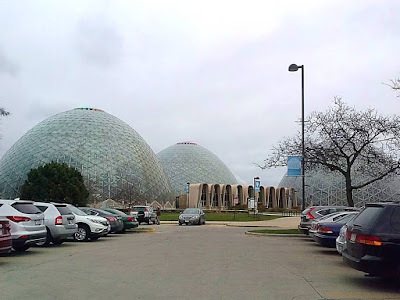 The Domes are a county park/horticultural conservatory housed in three giant geodesic domes built between 1959 and 1967. They consist of a Tropical Dome, a Desert Dome, and a Show Dome that houses exhibitions throughout the year. When we went, the Christmas display was up, and it was beautiful. PDaughter loved it, as I knew she would. Everybody loves the Domes. Her father and I lived just three blocks from Mitchell Park when we were newlyweds. We used to throw Frisbees on the big green lawn just outside the Domes, taking care to avoid the 3,568 Canada geese that seemed to occupy the space at all times. Of course, I showed PDaughter where we lived, in the first-floor flat of a house built in 1909. The neighborhood didn't look much different from the way it did from 1989-1991. I don't know if that's good or bad. I don't know if 48-year-old me could be as comfortable there as 21-year-old me was. Probably not. But I'm glad 21-year-old me lived there. It was awesome. I also drove PDaughter past the house I grew up in, the schools I attended, the corner stores where I spent my allowance, the movie theatres I went to (many of which closed, decayed, and then were restored and reopened since I was I kid), and the streets I roamed. Bless her heart, she feigned interest in all of it. 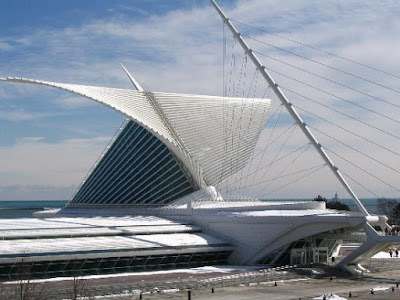 Still, I know she genuinely enjoyed the Domes, and the Milwaukee Art Museum, and my friend South Side Shelly's very eclectic home on the edge of Bay View. The Milwaukee Art Museum is a must-see. A treasure inside and out. I got to spend time with my brother and his wife (who was a childhood friend). That was really nice. PDaughter thought my bro was funny and cool, which made me happy. We've had very different lives, but we still fell into our old sibling banter as if we hadn't spent the last 20 years apart. Because family. My parents seem to be doing well now that they've moved from the woods of northern Wisconsin to the relative civility of Oak Creek. They're old now...that's a bit of a thing for me. They're healthy, and independent, and certainly as mentally sharp as they've always been (thank goodness for parents who have challenged me intellectually my whole life), but still, they're in their 70s. I love them, as I've always loved them, for raising me and worrying about me and helping me out when I've needed help. I hope that when PDaughter is grown, she sees me half as favorably as I see my mom and dad. Yet...they've been married for 52 years, and they act like it. They act like the old married couple of which I will never be a part. They bicker, they argue, they purse their lips and furrow their brows and give each other the silent treatment when the only other alternative is to shout, apparently. It makes my heart hurt a little. Because I don't think they're happy. Yet I don't think they could live without each other. And I feel a bit guilty that I terminated my own marriage before I could get to the same state. And I'm so much happier for that. But...we're all adults. And we make our choices. And among my choices is that I spent five days in Milwaukee with my Precocious Daughter. And I'm so glad I did. This Thanksgiving, I'm truly thankful for what I have. And for what I've lost. By the way, we had a non-traditional Thanksgiving. There was chicken, pork, beef, meat loaf...but no turkey. That seems appropriate. Still, I'm happy. And I feel so strong, you guys. I feel I owe some of that to you. I hope you're all thankful, too. Because if nothing else, gratitude is the reason for the season. I'm so glad you had the chance to go home and visit! The fact that Pdaughter got to go with you, and enjoyed herself is a plus. Not all teens are as awesome as yours!